“Year of the Rabbit,” bowl by Terri Kern. 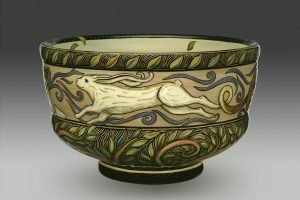 Hand-carved and painted ceramic bowl. 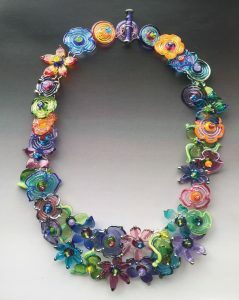 Saturday, Nov. 19, 10 a.m.- 4 p.m., Harmony Lodge, 646 E. Epworth Ave.
“Secret Garden,” necklace by Lisa Inglert. Sterling silver and hand-made glass beads. Twelve participants (Sara Caswell-Pearce, Judy Dominic, Jennifer Gleason, Renee Harris, Lisa Inglert, Terri Kern, Pam Korte, Mary Mark, Susan Naylor, Margaret Rhein, Ursula Roma and Pat Statzer) will offer their work. Their pieces include functional and decorative ceramics, art quilts and dolls, handmade paper and collage, metalwork, painting and jewelry. They also will sell prints, beaded and embroidered wall pieces, organic jams and mustards, soap, hand-dyed clothing, and mixed-media sculpture/assemblage. No admission charge. Nov. 11-Dec. 23, with receptions Nov. 11 and Dec. 9, 6-9 p.m., C-LINK Gallery at Brazee Street Studios, 4426 Brazee St., Oakley. The show features gifts and fine art made by local artists and crafters, including ceramics, jewelry, glass, wood, paintings, cards and more. Participants include Andrew Neyer, TomWillMake, Frank Satogata, Northern Market, S. Tercek, Paper with a Past, Rick Finn, Rheino Ceramics and others.